Why the consumer health titan could be a great long-term buy. Buy-and-hold investors love a stock that produces consistently higher earnings. No business is perfect, of course, and all companies go through their periods of weak results. But the ideal stock carries an above-average chance of generating bigger profits a decade from now, regardless of the economic conditions that characterize the intervening period. Healthcare titan Johnson & Johnson (NYSE:JNJ) could be one such investment. Here's why investors should consider owning this stock with the goal of holding it over the long term. 1. An industry primed for growth: Healthcare is a massive, $6 trillion marketplace, with positive long-term growth trends. Due to aging populations in developed countries and an expanding middle class in emerging markets, JNJ's industry is likely to expand, and the market leader has a good shot at capturing more than its fair share of those gains over time. 2. A long history of stock gains: Johnson & Johnson, the business, got its start in the late 1800s with innovative products like baby powder and the world's first mass-produced dental floss. More recently, the stock has been a great long-term buy for investors. It has grown at an 11% compound annual growth rate since 1985 -- and that doesn't include dividend payments. 3. One of the market's best dividends: Johnson & Johnson has paid -- and boosted -- its dividend for 54 consecutive years. The payout has risen at a compound annual growth rate of 9% over the last decade, but there's plenty of room for more gains, as JNJ's payout ratio is only 50% of earnings. 4. JNJ's commitment to innovating: JNJ credits innovation as a fundamental driver of growth, and it puts a mountain of cash behind that strategic priority. The company spends $9 billion on research and development a year, even besting tech-titan Apple and its $8 billion annual R&D pace. 5. Geographic diversification: JNJ's business is split evenly between the U.S. and outside markets. It has operations in 60 countries, and sells its products in every market around the world. 6. Innovation wins: JNJ has to introduce new-and-improved products at a more-or-less continuous pace in order to keep its market-share lead. The company has a strong track record on this score, as a quarter of its sales come from products launched over the past five years. Its pharmaceutical pipeline is currently stacked with over 30 drugs currently in Phase III testing. 7. Multiple profit streams: Buying a share of JNJ doesn't just give you part ownership in a single business. Instead, think of the stock as a collection of global health giants. Judged as separate businesses, JNJ's business segments include the world's fifth-largest pharmaceutical business, the sixth-biggest consumer health-product seller, and the sixth-largest biotech company on the planet. Oh, and toss in a medical-device giant that's worth more than $25 billion in annual sales. 8. Market-thumping profit margin: Johnson & Johnson's 70% gross profit margin makes it the fourth most-profitable business on the Dow. Last year, the company turned its $70 billion of revenue into $15 billion of earnings, converting an incredible $0.22 of every dollar of sales into profit. Compare that to fellow Dow titans Procter & Gamble (NYSE:PG) and 3M (NYSE:MMM), and their $0.13 and $0.16, respectively, of profit per sales dollar. 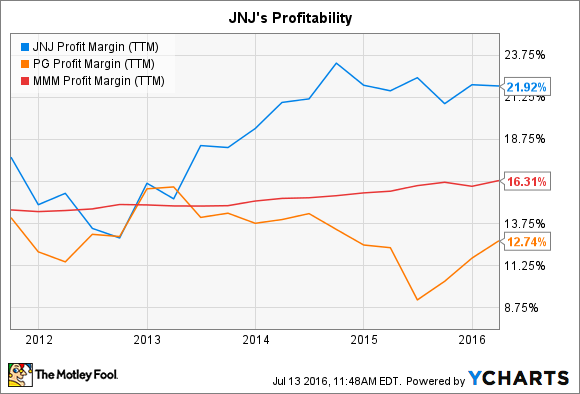 JNJ Profit Margin (TTM) data by YCharts. 9. Gushing cash flow: Operating cash flow grew to $19 billion last year, which allowed the company to invest heavily in the business while returning more than $13 billion to shareholders in dividends and stock repurchase. 10. Rock-solid balance sheet: JNJ has $38 billion of cash and securities on its books, compared to less than $13 billion of long-term debt. That lean borrowing structure is a big driver behind the company enjoying an extremely rare AAA credit rating. 11. Improving outlook: CEO Alex Gorsky and his executive team recently boosted their 2016 outlook, and see a return to sales growth after last year's unusual dip. JNJ expects revenue to tick higher by 2%, even after foreign-currency swings take a bite out of reported sales. 12. Reasonable valuation: Johnson & Johnson is priced at 22 times trailing earnings, representing a slight discount over comparable Dow giants like P&G (27) and 3M (23).